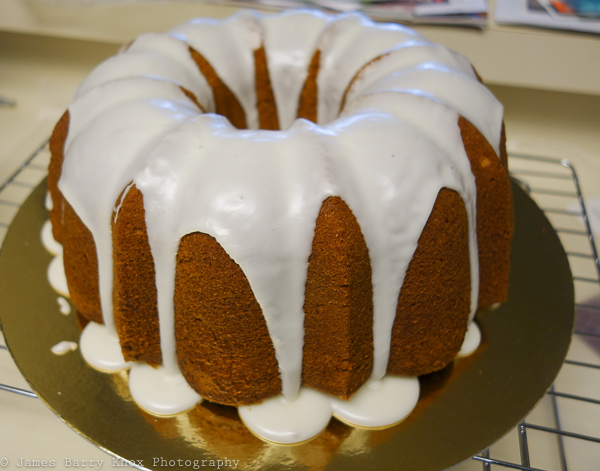 Chocolate Egg Nog Rum Cake, originally uploaded by in2jazz. Cream butter, gradually add sugar, creaming until light and fluffy. Sift flour with baking powder and salt. Add eggs one at a time to creamed mixture, beating well after each addition. Add flour mixture alternately with eggnog and flavoring, beating after each addition until smooth. Add package of chocolate pudding, rum and cocoa and mix well together. Pour batter into a greased 12-cup bundt pan. Bake at 350º for 55 minutes. Cool in pan for 10 minutes then remove and place on wax paper and let cool before putting on the glaze. Melt butter in saucepan until lightly boiled (do not overheat). Add powdered sugar slowly with a wire wisk then add granulated sugar. Once dissolved under low heat, add brown sugar. After the brown sugar has dissolved, add Karo syrup. Keep stirring with wire wisk. Bring to a light boil. Add rum and bring to a boil while stirring with a wisk. Remove from heat and wisk in the vanilla extract. 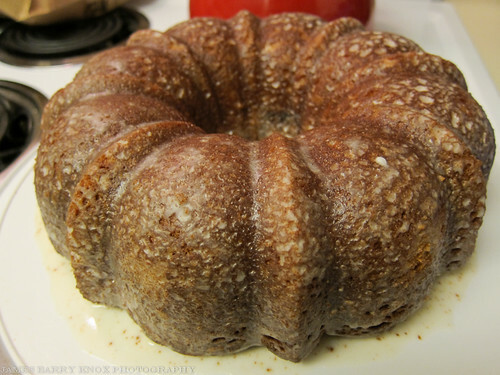 Add more powdered sugar or use less rum for a thicker glaze. Poke holes in the cool cake wit fork. Drizzle and brush the glaze over the cake. 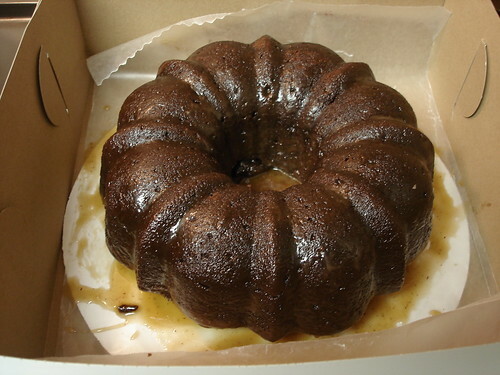 Continue to brush the cake with glaze that has ran down the side. Let dry and serve. 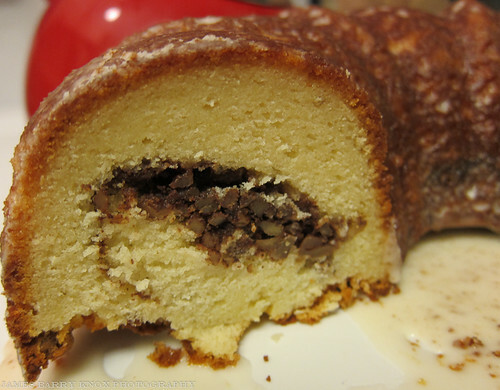 For Chocolate Rum Cake, omit the egg nog and use 1 cup of milk with the flour mixture. 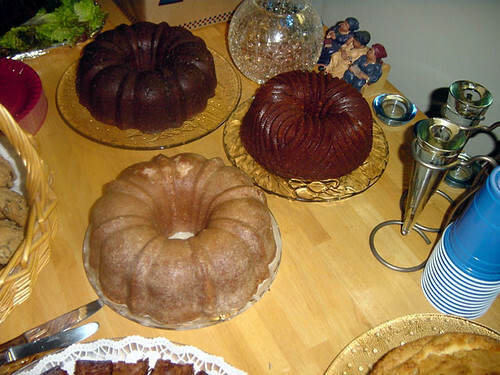 For Plain Rum Cake, omit the egg nog and Hershey’s Cocoa. 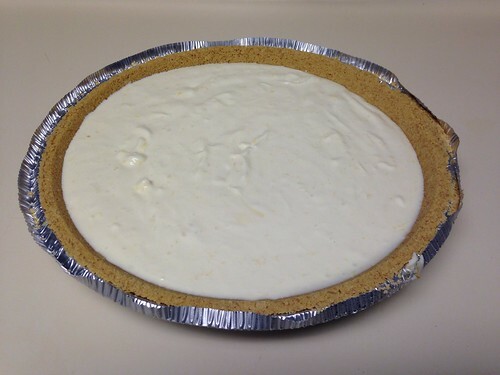 Use Jell-O French Vanilla pudding and 1 cup of milk with the flour mixture. Cakes Galore, originally uploaded by in2jazz. I ran short of time so I was unable to make the cheesecake and red velvet cake. I made the cinnamon rolls a couple weeks after the festival and they were great. Special thanks to CW, JS, & JS for the ham, chicken, and coffee. Also, thanks to everyone who took photos and sent them to me. Where do I start? Baking is just as much a part of my life as music. I usually am playing good music while baking. I think I first tried my hand at baking when I was in my teens. I had been thinking about creating a separate blog devoted to baking for a while but I could not imagine having two blogs. Not sure how often I will post over here as I do not bake every week. I can guarantee you lots of good photos and a fotoblog along the way. This clever photo was taken during the recent Christmas holiday baking season. 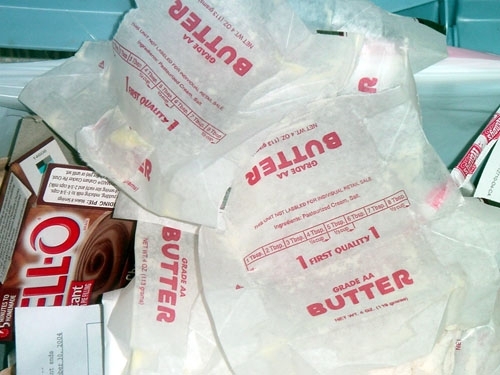 I went through a lot of butter. I will tell you more about that real soon. Creating this blog was much easier than my first one. I dedicate this blog to my dad who passed 5 years ago on this day. Recipe borrowed lovingly from an awesome individual. Measure 1 3/4 C flour into yr large mixer bowl. Add yeast and blend. Measure milk, water, shortening, sugar, and salt into saucepan. Blend. Heat until warm (about 120-130 degrees F). Pour into flour/yeast mixture. Add eggs. Beat 30 seconds with electric mixer at low speed, scraping bowl constantly. Beat 3 more minutes at high speed, scraping bowl occasionally. Stop mixer. Gradually stir in more flour (by hand) to make a soft dough. It will be rather sticky. Knead on lightly floured board or counter until nice an’ smooth, about 5-10 minutes (it’s good exercise!!). Cover with bowl or pan and let rest for 20 minutes. Shape as desired. Here’s what I do: I cut the hunk of dough in half, roll out one of the halves until it’s flat and rectangular and large, brush it with butter, sprinkle it with a cinnamon/sugar mixture, add raisins (sometimes), and roll it up. Then I cut off the ends and cut the rest into 1″ wide slices. They usually fit nicely into 2 9″ greased cake pans. Then I put them in a warm oven (I usually warm it to 200 degrees for a few minutes, then turn it off) with a pan of hot water under them and a foil tent over them and let them rise for 40 minutes, or until doubled. Bake at 350 for 10-12 minutes. 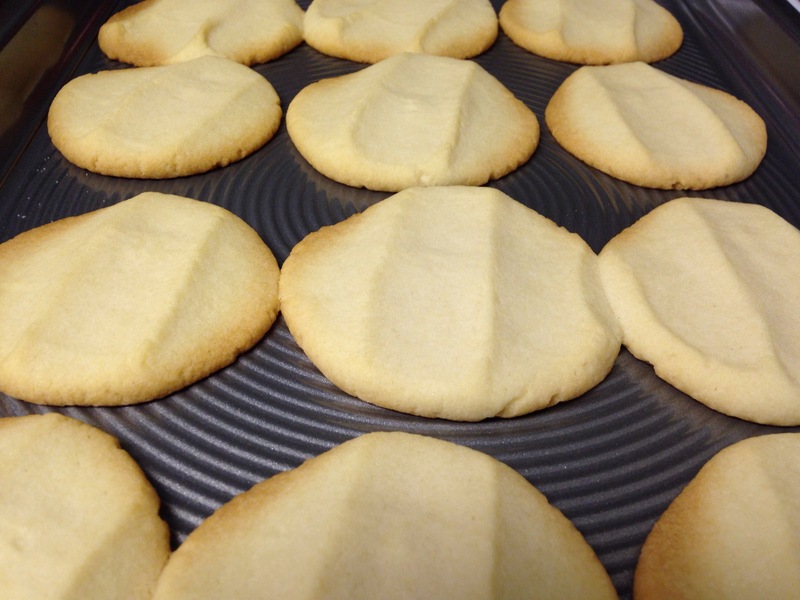 You can ice these with powdered sugar icing (I usually do) after they’ve cooled off, but believe me when I tell you that they’re wonderful just plain and warm outta the oven. Cool them on a rack. 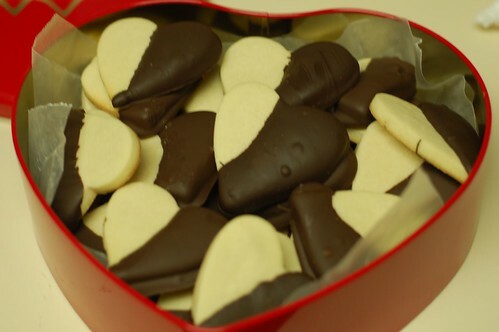 When they’re cool, you can wrap them in foil, and freeze. Just warm them in a 250 oven for about 45 minutes and oooh boy, it’s like you just made ‘em. Enjoy them — the recipe is from a cookbook called Homemade Bread, published by the Farm Journal people in 1969. Add milk and powdered sugar to get the glaze to the consistency that you desire. 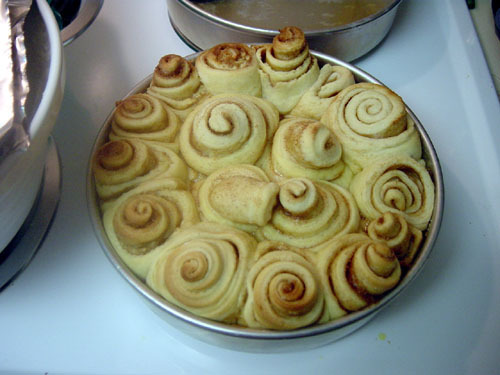 My dad made cinnamon rolls for us when we were kids so every now and then the thought of making them myself would pop through my brain and then disappear. I had never made anything using yeast before so I was a little nervous about how these rolls would turn out. It was much easier than I expected and I learned that working with yeast was not as terrifying as I thought. I mixed everything by hand and kneaded the dough by hand as well. As you can see in the photo above, my pan was a little crowded so I will put less in the pan next time and measure my strips of cinnamon dough a little better. Overall, I was very pleased. You are currently browsing the Recipes category at Simply J Life.